Chet Cunningham was a workhorse at writing action/adventure paperbacks, knocking out dozens and dozens of them in multiple genres (not to mention idiosyncratic non-fiction books with titles like “Three Simple Steps to Flatten Your Belly” and “Stopping Restless Leg Syndrome”. 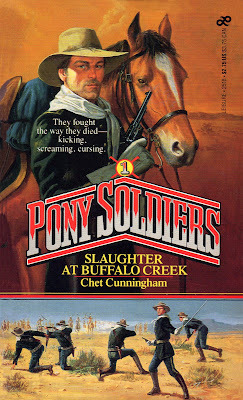 Beginning in 1987, he was able to launch an interesting western series called 'Pony Soldiers', about cavalrymen in Texas and their dealings with outlaws and Indians. At first glance it looks like an 'Easy Company' knock-off, but it isn’t. Nor is it a horn-dog adult western series like the 'Spur' novels he was writing at this time. The first book, “Slaughter at Buffalo Creek”, immediately shoves the reader up against the wall and hits him with an exceptionally grim massacre perpetrated by Comanches. Supply wagons headed for Fort Comfort are looted after every last cavalryman escorting the train has been killed. Their bodies are stripped and mutilated, and then the warrior chief discovers something hidden under blankets in one wagon: the terrified wife and small children of the fort’s commander. He murders the little boy and the little girl is carried away, but not until after the wife has been gang-raped, slashed, killed and scalped. The grieving fort commander swears vengeance, and that’s what drives the series. But this particular novel goes in a different direction. There’s certainly a lot of material about searching for the Comanches, and about the contrasting ways of life at the fort and at the Indians’ camp. But now a new plot emerges, involving a bad lieutenant who’s discovered and stolen $8,000 in government gold, left behind in one of the wagons by the marauding Indians. This story about the lieutenant turns out to be even more interesting than the vengeance stuff, and it’s reminiscent of Cunningham’s fun 1970s series about gold-hungry schemer 'Jim Steel”. I won’t disclose whether the thief gets away with the loot or not, but once that narrative is resolved, the book is over. The vengeful commander will have to wait until the next novel (or later) to get even with the Comanches, and that’s going to irritate some readers. The rest of us can shrug it off and look for the next book, entitled “Comanche Massacre”. “Massacre at Buffalo Creek” sags a little bit in the middle, but overall this is quite a strong novel. Unfortunately, the original paperbacks aren’t all that easy to find, but if the later installments are as good as this one, they’re well worth seeking out. The series is also available as ebooks.